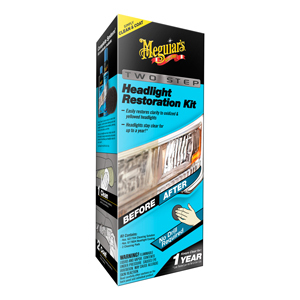 Having the best headlight restoration kit in your toolbox is a must for every vehicle owner. Over time, your vehicles headlines can become dull, scratched, and yellowed. Not only does this look ugly, but it also decreases nighttime visibility on the road. A good headlight restoration kit can help you buff up your headlights and make them shine again. Most kits bring all the tools you need to resuscitate your headlights and make them look brand new by restoring the clarity of old, yellow, hazy, or dull lenses. The kits contain sanding discs and a polishing pad, among other tools. You don’t normally need additional gears to use them, and they can be used on any headlight lens including trailers, snowmobiles, and motorcycles. Restoration kits can save you the hassle of having to replace the whole lens which can be a very time-consuming and expensive process. This is a much cheaper option that can restore the lenses to a nearly-new state and improve visibility and safety at night. We’ve rounded up some of the highest quality headlight restoration kit reviews that are available right now. Meguiar is present again in our reviews but this time with a more powerful and long-lasting restoration kit. 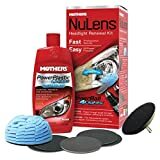 You will be surprised of the number of items this kit includes, but each of them contributes in a perfect way to get rid of the yellowed, lightly scratched or seriously oxidized headlamp lens. This headlight restoration kit gives you everything you need to get the job done – two 3-inch sanding discs with 1000 and 3000 grit, sanding pad, a 4oz bottle of Plast X, another bottle of 2oz headlight coating and a sponge to apply it to the headlights. With so many tools to get the perfect shine and clarity of your headlights, the only thing left is to find a drill for the sanding discs. It is not impossible to sand the headlamp lens manually, but a drill will save your time and energy. You can use this heavy-duty restoration kit for up to 3 vehicles before the sanding pads give out. But even in this case, you can easily find replacements in your local auto parts house. However, there is one thing that has bothered us and this is the streak marks from the protective coat finish. 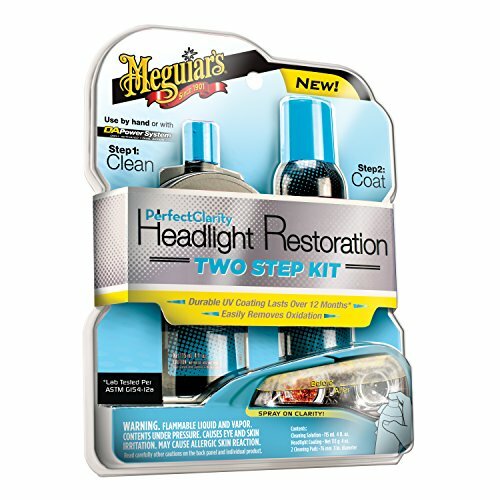 The SYLVANIA Headlight Restoration Kit is great option for polishing up your headlights and bring them back to clarity. 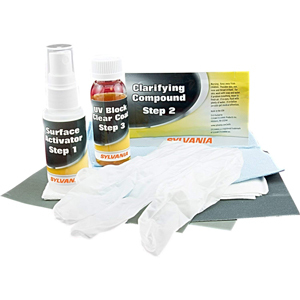 The kit is used to fully remove haze, dullness, and corrosion from any headlight lens. 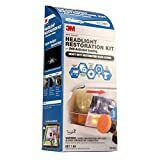 The kit includes all the essential restoration equipment, as well as a simple 3-step process that will save you time, energy, and a lot of money is headlight replacements. In the end, you will end up with a bright new headlight with better light output and increased nighttime visibility. The best part about the SYLVANIA Headlight Restoration Kit is that it comes with a lifetime warranty on performance for as long as you own your car. This is way more than any other kit promises. A lot of the issues with other restoration kits is how long they last. Many of them will look great for the first few weeks and then start to pull out again once the polishing starts to come off. The SYLVANIA Kit seems to have resolved that problem. This can be a huge plus as re-polishing headlights can be a hassle and can become very expensive. Pricing wise, this is also one of the cheaper but also high-quality options available in the market. This kit promises to restore your headlights in a “quick and safe” way. Like other systems, it is ideal for removing yellowing and stains, and to evenly buff out scratches, smudges, and other flaws. The system includes a 3-inch Backing Plate, PowerBall 4Lights Polishing Tool, Restoration Discs, 8 oz. PowerPlastic 4Lights Polish. The sanding and polishing tools need to be powered by a drill, so this is another system that will require additional safety when polishing the lens to avoid hitting the vehicle. This system will help you get polished and rejuvenated quite quickly as the sanding pads are power drilled. This saves a lot of time compared to other systems. You can rejuvenate your lenses quite quickly with this system as both the polishing tool and sanding plates are drill powered. This definitely makes it easier than polishing by hand. Because the sanding is done by a drill, there is a higher risk of damage to the lens. Make sure you start with a low velocity at the beginning to avoid any deep scratches. A microfibre cloth is not included in this kit. Microfibre cloths are usually necessary for the polishing process, so if one is not included, you need to get one on the side. 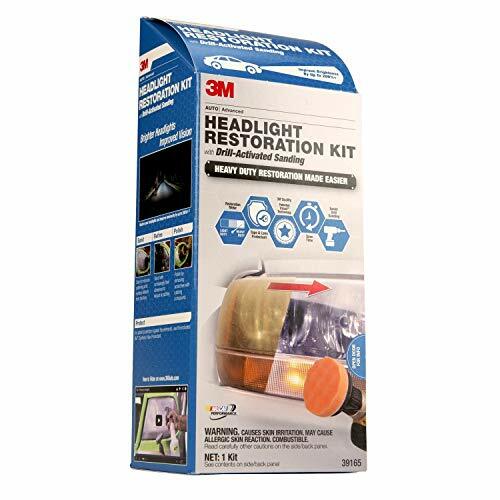 The 3M Headlight Restoration Kit is another 5 step restoration kit by 3M at a more affordable price than the 3M 39045 Headlight Renewal Kit with Protectant. This is a simple system that contains sanding discs, polishing pads, polishing compound, protectant, and tape. As with all other kits, it is important to follow the directions clearly to ensure successful results. 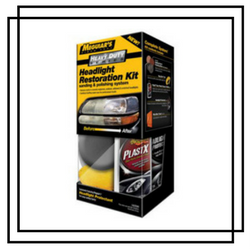 This kit is a well rounded do-it-yourself system that is ideal for beginner headlight restoration. The length of time that it takes to restore both headlights will largely depend on the condition of the lens, but it should not require more than an hour total work. The sanding disks can be tricky as it will feel like the lenses are not smooth enough until you get to the final grit paper. However, once you do, you will be surprised by the results. The polishing compound does a good job in clearing out dullness and bringing back the shine. We recommend using a powered buffer with this one as it may require more elbow grease to get the desired results. Overall, this is a good system for beginners as long as the headlight is not in terrible condition. This is a very different, but interesting, restoration system. The product promises clear headlights in only two steps. 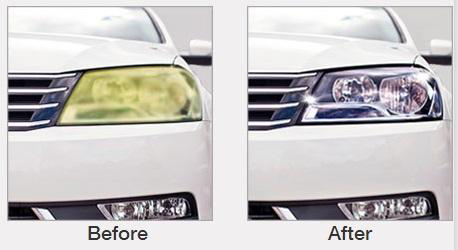 It is a fast and easy solution for cloudy and yellowed headlights and designed for beginners. 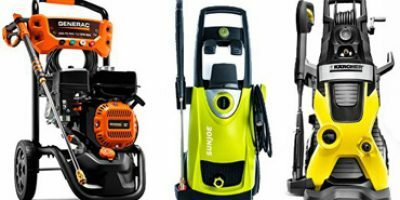 The system comes with two scuffing discs both of which can be attached to a power tool, a cleaning compound, and a finishing spray. Step one is to sand the headlights using the two scuffing discs and the cleaning compound. Step two is to spray the headlight with the finishing spray. There is no polishing involved in this system. Although several steps are missing, and the finishing spray has replaced all polishing work, this system is actually excellent for clearing out cloudy headlights. We do not recommend this if your headlights are in serious need of some TLC, if there are deep scratches in the plastic, or if there are melted areas in the headlight. The simple scuffing discs may not work well in this scenario. For beginners, this is your go to restoration system. If you are on a budget but still want to get your headlights done, then this is your product. 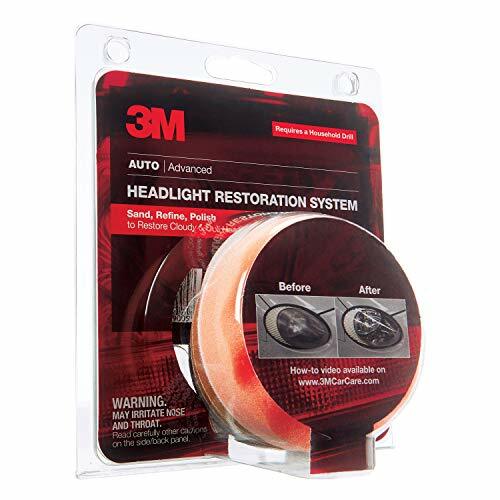 The 3M restoration kit might be affordable but that does not mean it cannot restore the clarity of your vehicle’s headlights. 3M’s kit is packed with 6 sanding discs and a holder. In other words, you are supposed to clean your car’s headlights manually but we do not think of this as a drawback. On the contrary, with a hand polishing kit, you will not search for any other additional tools to do the job. Yet, if your headlights are in a really bad condition, then you will spend a lot of time fixing that. For a basic kit, this product can give you great results, especially when the instruction’s manual is so comprehensive and easy-to-follow. There are only 5 steps but we can guarantee you that light scratches, yellowed headlights or any buildups will be removed and you will definitely like the outcome. After all, buying new plastic lenses is a way more expensive than cleaning your current ones with the right product. And one last thing, the 3M kit is intended to be used only once. 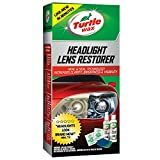 The Turtle Wax T-240KT Headlight Lens Restorer Kit comes with clarifying compound, spray lube, 4 sanding discs, and one sealant wipe. In addition to this, you will need a microfibre cloth and some tape. One great thing about this kit is that it comes with its own cleaning compound. This solution can be used prior to starting the sanding process to ensure there is no debris left over on the headlight. The cleaning compound itself will do a fantastic job in clearing out the headlight prior to the sanding. Immediately, you will see a difference after rubbing the compound for a couple of minutes. The next steps in the system will clear out the headlights further, revealing a bright new lens. one thing to not with this system is that the sanding discs on this kit are quite small, and a drill cannot be used. Unless you have a very small headlight that can benefit from the size of the sanding discs, this kit may be very time consuming to use. Overall, this is a great system if you have small headlights. For those with bigger headlights, this kit is still good but could take more time to use. 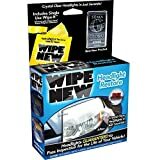 The Wipe New HDL6PCMTRRT Headlight Restore Kit includes two microfibre cloths, a sanding block with 2 different grids on each side, a small pre-soaked WipeNew towel, rubber gloves, and instructions. As you can see from the list of items, this kit is completely different than other restoration kits. The only real polishing and sanding products are the small sanding block and the WipeNew cloth. However, the kit shows promising results on slightly faded headlights, and it can bring back a lot of shine to cloudy lenses. The WipeNew towel is quite saturated and can be used for two to four pairs of headlights. The main component in this kit is the saturated towel which shows to improve the look of the headlight even without sanding. The powerful chemicals in this towel will clear out dullness and fill in slight scratches. Because of the powerful chemicals, it is definitely recommended to use gloves during this process. Compared to other systems, the clarity will not last as long. Also, this system is not recommended for heavy duty applications, and for headlights that require deeper sanding. 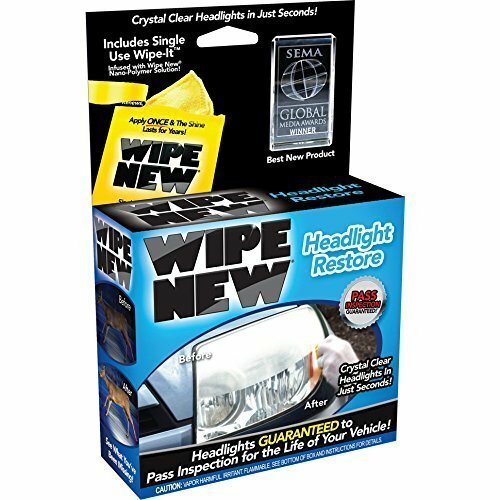 Regardless, the wipe is something great to have on hand whenever your headlights need occasional cleaning. 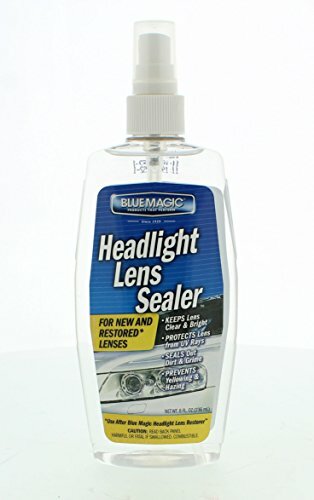 Blue Magic 730-6 Headlight Lens Sealer is a single product used for clearing out faded headlights. This is not a restoration system, but simply a compound that can be used for clearing headlights in between restorations. 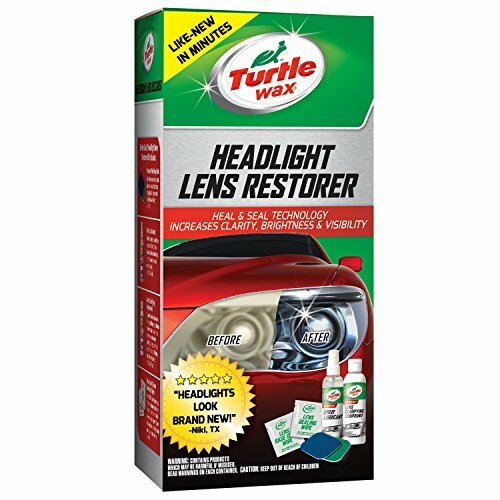 The product is very effective in filling out very small cracks and clearing out headlights. However, it is a lot more efficient if used after polishing your headlights. 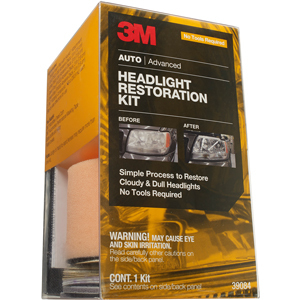 We recommend that you sand and polish headlights using a restoration kit prior to using this product. The Blue Magic 730-6 Headlight Lens Sealer will seal off your work and make the polish lasts much longer. The product goes best if applied with a cloth as opposed to sprayed directly on the lens. Lastly, the amount of product that comes in the bottle is enough to last you for a few years. This should be a staple in every garage. 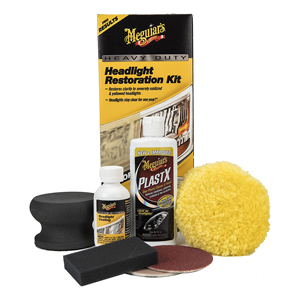 Another quality product from Meguiar is the 2-step restoration kit which is not only easy to use but also professionally cleans your car’s headlights. 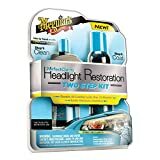 The kid includes a 4oz headlight cleaning solution that is to be used with the 2 cleaning pads. Did we mention that you do not need a drill? With this hand polishing kit, you will not even think about it because following the steps in the instruction is all you need. We really like that the cleaning detergent will quickly and efficiently remove any tough oxidation, dirt or grime. And with the use of the 2 pads that come with the product, this process will be even faster. It is true, however, that you will have to rub or scrub the headlights depending on their condition. As for the second step, the 4oz headlight coating will provide your car’s headlight lens with a perfect protective film and make them UV-proof. Moreover, you do not need to spray them a second time since one coat is enough for the spray to last long. However, the protective coat may begin to wear off sooner than the manufacturer states on the package, so check the condition of your headlights regularly. This is another kit brought to you by 3M. The kit includes a pad holder, 6 sanding discs, 4 finishing discs, 1 trisect disc, polishing compound, a buffing pad, and directions. This system offers a simple four-step process for clearing out dull headlights. Like other systems, it involves the simple process of sanding, buffing, and polishing. During the process, the wet sanding stage is where you really start to see the progress. Once the sanding step is complete, you can definitely see and feel the difference in the headlight lens. The kit has an excellent process that anyone can follow. A drill is not only recommended but necessary in order to use the sanding pads. The best aspect of this restoration kit is complete and easy to follow instructions. Following these steps to the point will allow you to complete the process with no issues or hurdles. The sanding pads in this particular system do let out quite a bit of dust, so a dust mask is definitely recommended here. Lastly, this is one system were a little extra elbow grease will pay off. When you have an old, dull, scratched, and yellow headlight that is reducing your nighttime visibility, having the right restoration kit is key. A dull headlight is not only unflattering to your vehicle, but it can also be a huge safety hazard at night. Headlight clarity is not something we are usually concerned with and don’t notice we need restoration until too late. If you are noticing that you use your high beams more often than before, or are simply having a hard time seeing at night, consider checking out your headlights and assess if restoration is required. Below are some essential steps you should take when buying a new restoration kit. Purchasing a new restoration kit can be a difficult decision. There are many options available in the market today that vary in price and effectiveness. There are some kits available that require polishing tools, and others that are stand-alone kits. The former tend to be known as higher quality kits that will deliver greater results; however, this is not always the case. The latter is much easier and cheaper to use but you could end up with unsatisfactory results. The good news is that even the cheapest kit can dramatically improve your headlights, regardless of if they need power tools or not. Your choice of a restoration kit should depend on how damaged your headlight is, and how much you are willing to spend. Finding the sweet spot between these two will result in a great kit that delivers results. Some kits will include all the essentials required to restore your headlights. This includes sanding discs to get rid of scratches, polishing and finishing discs to polish the lens, polishing product or rubbing compound to shine and buff, and an applicator or pad to buff out the headlight. Other kits, however, only offer a polishing cream and some sort of applicator pad. These are typically used for less severe scratches and for maintenance of the headlight. When choosing your new headlight restoration kit, make an assessment of the damage to your headlights. How old are they? When was the last time you restored them? How is nighttime visibility? Do you normally need to use high beam to see at night? Do they look yellow, very scratched, and dull? Answering these questions will help you determine how much help you need from a restoration kit, if power tools are necessary, or if hand polishing is sufficient. The most common way that vehicle owners determine if a headlight needs restoration is with reduced nighttime visibility. When you start to notice that the headlights are not doing what they are supposed to do, a quick look at them will show that they are dull and yellowed out. The severity of the damage will determine what type of kit is best for your situation. If the damage is severe, and the headlights are cracked or broken, no restoration kit will help you at this point. A headlight replacement is the best option. If the headlight is severely scratched and light can barely pass through, a restoration kit with sanding pads could greatly improve its appearance. If there are minor scratches, a little dullness, and some yellowing, a simple polishing product could do the job just fine. Once you’ve narrowed down what level of restoration you require, you can choose the right option by price, brand, or quality. Ideally, you should go for the kit that offers the best results over time. Many of the cheaper options out there will give you great results that last a few weeks, and then you need to restore the headlights again. Over time, this can become very expensive. A good restoration kit should provide a polish that lasts over a year before restoration is required again. Some of our reviews offer great insight into the most popular restoration kits available in the market today. As long as you know exactly what type of restoration is needed by the headlights, this step will just be about picking the best brand available. Using the product reviews below, choose the restoration kit that offers the best bang for your buck. If the price is an issue, reach for the kits that don’t require power tools. If time or energy is an issue, choose the kits that offer the best ease of use. Remember, whatever the result, using a polishing kit to restore your headlights will end up being a lot cheaper than spending hundreds of dollars replacing them. Having a headlight restoration kit is key to the proper maintenance of your vehicle. Not only will it keep it looking sharp, but it is essential to improve nighttime visibility and stay safe on the road. Restoring your headlights back to their former glory need not be a difficult task. This should be a staple in every driver’s car maintenance process and should not be ignored. Clean headlights are necessary for clear night vision and the safety of yourself and other drivers on the road. Best of all, this is a process that can easily be done at home without the need to pay the maintenance guy a ton of money. Having the right restoration kit is key. Read our Restoration Kit Buying Guide to determine which restoration kit is right for you. Once you have the ideal restoration kit, follow the steps below for an easy and painless restoration process. We recommend that you wear some sort of safety gear when doing this. You will be working with compounds that could be corrosive to the skin and could be harmful if contact is made with the eyes. We recommend some type of rubber gloves a dust mask, and some sort of eye safety. Next, prepare the vehicle. Tape around the headlight to protect your vehicle. 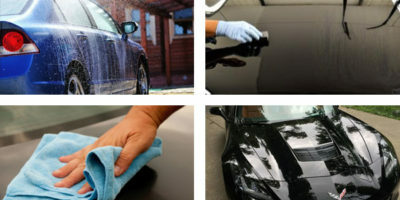 You will be sanding, buffing, and using chemicals that could damage the paint or the bumper. Taping around the headlight will along you to work freely without worrying about the rest of the vehicle. Clean the headlight lens thoroughly from any dirt, debris, or stains. After driving around the city, the vehicle’s front will be covered with all types of debris. When sanding, this debris could cause deeper scratches in the plastic and become much more difficult to remove. Cleaning the headlights prior to starting the restoration process is essential. Standard soap and water is the best solution here as this is just a pre-cleanse prior to the polishing. Using a regular kitchen sponge, soap, and water, rub away at the headlight until there is no dirt left. Once done, rinse off the soapy water completely and towel dry. Sanding will remove away scratches that cannot be taken off my simply polishing or washing. This will also remove oxidation and melting caused by the heat of the lightbulb. Most restoration kits will bring different levels of sandpaper. If the headlight is very damaged, with deep scratches or cracks, start with the 800-grit sandpaper. Sand in a side to side motion with even pressure across the lens’ surface. Avoid concentration on one area for too long, or you could change the shape of the lens. Ensure to occasionally wet the sandpaper to prevent heat burns to the lens. Work your way down to the finer sandpaper grits using the same tactic for sanding. As you go down in sandpaper grit, you will notice the headlight becoming softer and smoother. Each finer sandpaper will remove the scratches left behind by the last. End your sanding process with a very fine 2,500 grit sandpaper. Once done, blow or brush away any remaining dust off the lens. All restoration kits will bring some sort of polishing compound. Once sanding is complete, smear some of the polishing cream directly on the lens. Using a flannel or microfiber cloth, polish the lens in a circular motion, applying even pressure to the surface. Doing this by hand will take around 10 minutes per lens. Power tools can always accelerate the process. If you are pressed for time, use an orbital polisher. However, be careful not to damage the nearby paint when doing so. There are also a few ways to polish your headlight lens at home without a restoration kit. Although these may not be as effective as using a proper polishing compound, they have been shown to significantly improve headlight lenses for some people. One such product that has been proven to work effectively as a polishing compound is toothpaste. Simply replace the polishing compound with your regular toothpaste and following the same polishing process. In some cases, you may still see small scratches, bumps, or discoloration after polishing. To finish off your lens, soak a 1000 grit piece of sandpaper for about 10 minutes. Use this to lightly sand areas that need additional help. Remember to sand lightly from side to side. Continue sanding until the problem areas are gone. When complete, clean and dry the area. Repeat these steps with 1500 grit, 2000 grit, 2500 grit, and 3000 grit sandpaper. Once you’re done, remove the masking tape and give the lenses and surrounding areas one last wipe. These steps could differ slightly depending on what type of restoration kit you will be using. In all cases, patience is key. The sanding step is an integral part of the process to make sure that all damaged, scratched, and melted parts of the lens are removed prior to polishing. Polishing on top of scratched or melted material will not make the lens look any better. Take your time, and ensure that the lens is properly sanded and buffed before proceeding. The reason as to why vehicles need headlights is pretty obvious. Without them, we can’t see at night. They improve visibility for drivers driving in the dark, rain, and fog. Not only do they make it easier, but they are at times absolutely necessary. Historically, things were pretty simple in that there was only one type of headlight. When asking yourself what type of headlight to choose, the decision was made for you since there were no other options. Today, however, technology has advanced in this field. We now have a variety of different options to choose from. This guide can help buyers when selecting a new headlight bulb, and determine which is the one best suited for them. All headlights serve the same purpose in that they will light up the road for the driver. However, each type of bulb has its advantages and disadvantages. Your choice will depend on what you drive, what the weather is like in your city, and what look you want for your vehicle. Taking the following into consideration can help you chose the best light for your car. Halogen lights are the most common type of headlight which is found in most vehicles. These headlights produce a bright, white light. The bulbs use heated tungsten filaments to produce light and with it a significant amount of heat. Because of this, halogen lights are actually very wasteful in energy. Halogen headlights are ideal for budget drivers in need of a replacement. Because of their low price tag and long lifespan, they are the most likely ones that budget drivers will reach for. Halogen headlights are proven technology. They have been used for years and are proven to do what they’re supposed to. They have a softer light that other options which make it better for other drivers. However, it could make it more difficult for drivers that live in suburban areas, farms, and other areas with a low night light. This type of headlight is ideal for the budget driver who lives in a populated city with lots of street lighting. Xenon, or high-intensity discharge, lights are the brightest of the available types of bulbs. They produce a brighter light than the halogen ones with less heat. They require an exponential amount of power. This means that they need a high amount of power to power up, but then require far less power to stay on. Overall, they are much more efficient than halogen headlights. If you have a vehicle, such as a motorcycle, with limited extra alternator power, then spending the extra cash on this type of headlight is recommended. LED, or light-emitting diode, lights are one of the newest types of bulbs available in the market today. The technology behind LEDs involves small diodes that produce light when electric current cites their electrons. The main advantage of LED lights is their ability to come in different shapes and sizes. The LED light has a small size that makes it versatile enough to do so. This makes LEDs perfect for the vehicle enthusiast who wants a great new look for their vehicle. All in all, LEDs look cool. They produce bright light and can be shaped to whatever you want. This is one of the classiest choices available and is more commonly used in stylish cars. LEDs are also popular for their low power requirements. LED headlights are ideal for vehicle enthusiasts looking to improve the look of their vehicle. It is important to note that you get what you pay for. Cheap is not necessarily a good thing, but expensive isn’t always best. Take the above into consideration when choosing your new headlight technology, and make sure you are choosing something that is suited to your needs. Each of these technologies is different enough that making a choice based on your needs should not be a difficult decision. Whether you are a daily driver, someone in need of high power, or a car lover, the right option is available for you on the market today. Having clean and clear headlights is a must for every vehicle owner. When you have an old, dull, scratched, and yellow headlight that reduces your nighttime visibility, having the right restoration kit is key. The headlights will look great after polishing and allow you to see better at night. A good headlight restoration kit can help you buff up your headlights and make them shine again. Purchasing a new restoration kit can be a difficult decision. However, they are essential since restoration kits can save you the hassle of having to replace the whole lens which can be a very time-consuming and expensive process. Learn everything you need to know about headlights and the best headlight restoration kit. Old, dull, scratched, and yellow headlights look very unflattering on any vehicle and can reduce nighttime visibility. Having the right restoration kit is key to bringing back your headlights to their former glory. 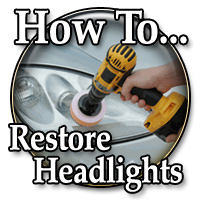 Headlight restoration is essential to the proper maintenance of your vehicle. Not only will it keep it looking sharp, but it is essential to improve nighttime visibility and stay safe on the road. We hope you found headlight restoration kit reviews useful and welcome your comments.